Sew Can Do: CraftShare Week 4: Turtle Cake & Modeling Chocolate!! 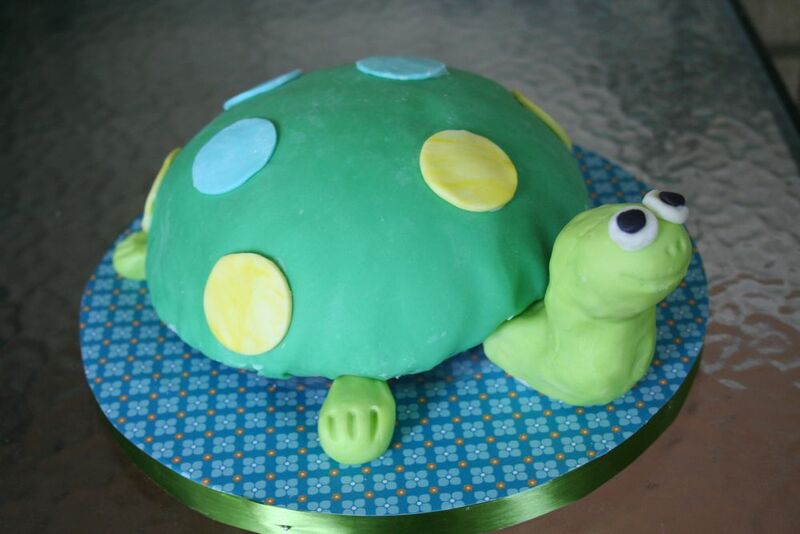 CraftShare Week 4: Turtle Cake & Modeling Chocolate!! I really love the idea of cake decorating. Mostly because it involves taking something delicious and making it pretty too, but also because it's an area of crafting that is very new to me. I loved to oooh and ahhhh over beautiful covered cakes but never thought it would be possible to make something that looked and tasted good by myself, until I discovered Modeling Chocolate (aka Candy Clay). That's right folks, this is not a fondant covered cake! What is Modeling Chocolate? 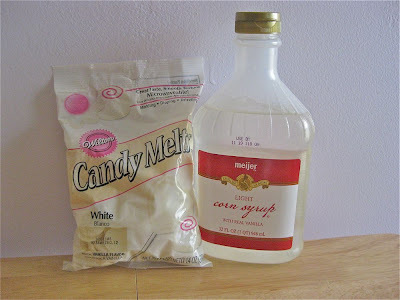 Just a mixture made from corn syrup and candy melts (those chocolate disks that are usually used for making suckers & dipping stuff). Modeling chocolate has a texture like play dough, so it can be use just like fondant or gum paste to decorate cakes, cookies or make edible sculptures. Roll it out, cut it, shape it, whatever you want! It doesn't really get hard or change consistency, it keeps well, and, most importantly, it tastes really good. 1. Melt one package of chocolate melts in microwave according to package instructions. The chocolate may not look like it's completely melted, but once you stir it a bunch, it should be fine. Be sure it is nice & smooth or you'll have visible chunks later. You can overcook it and then it's burnt or the consistency gets wrecked, so this is an important step! 3. Spread out your mixture on a cling wrap covered cookie sheet and spread nice & flat until it's about 1/2" thick and cover top with cling wrap. 5. After it's set, take small sections of the modeling chocolate and knead them with your hands until soft and pliable like play dough. Continue until you've worked the entire batch and then use it or wrap with cling wrap and place in an airtight container. It should keep for a couple of months wrapped up. 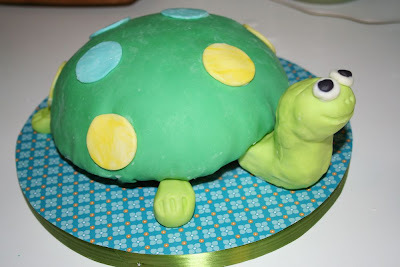 To make this turtle cake, I used a pyrex mixing bowl to get the shell-shaped cake & then covered the cake with a thin layer of buttercream frosting when it was cool. 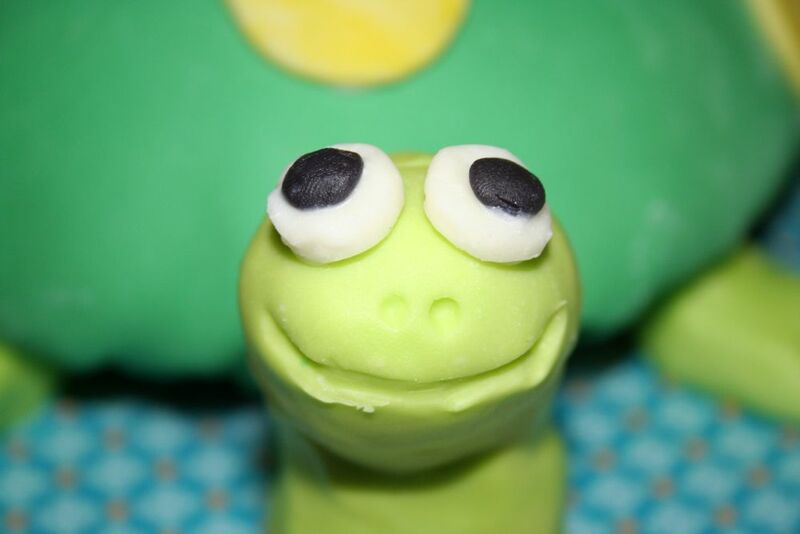 I colored my modeling chocolate in the various colors needed and rolled out & covered the cake with the kelly green. I hand sculpted the legs, tail & head in the lime green and used the end of a small paintbrush to make the facial features & details on the feet. 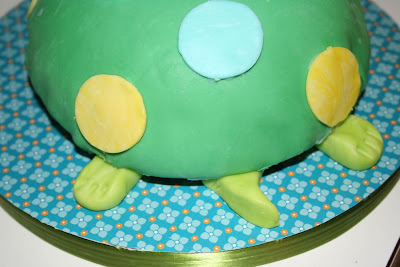 The circles were made with fondant cutters and attached with icing. For a nicer presentation, I covered a cake board with some scrapbook paper and wrapped a ribbon around the edge. Now it's your turn! If you've made any kind of cake, show it off. It can be pretty, creative, colorful, even crazy in design, I'm not picky - I just like cake. Add your pics to the CraftShare Flickr pool or tell us some of your favorite ways to decorate or tips for making cakes. I know you've got it in you - I've seen some tasty ones in the Craftastic Monday link party, so don't get shy! Heck, even cake disaster stories are appreciated (I know I'm not the only one with some of those - see Easter Cake). great job I'm going to try my hand at this! Yay Modeling Chocolate. Thanks for the recipe. Can't wait to try it. How fun! I can't wait to try this. Your turtle is just too cute for words! Great job on this! That is one cute turtle!! What a COOL cake! Thanks for this post - I'm inspired! This is awesome! Just what I needed... I've got to make a monster cake in the fall.... going to have to test out this technique! Thanks a bunch!! love him!! My youngest will be a Terrapin for 1 more year at elementary school and I'd love to do this for something at the school. What an adorable turtle, I just want to eat him right up! I really want to try making one of these! Thanks for linking up to Hoo's got talent! it is SO super duper CUTE! I love cake decorating too but haven't stepped into modeling chocolate or fondant... maybe I should because this is too cute! Thanks so much for sharing this idea. I am going to try it as soon as I go and get the chocolate melts. Seriously?!! Chocolate??!! Because chocolate isn't appealing enough that you need make it more-so? Can nobody make spinach and rice cakes cute? Really, it is very cute. Well done! Thanks for sharing ... please come again! I do a lot of cakes and had no idea modeling chocolate was so easy to make! Thanks for sharing! Thanks so much for sharing on craft Schooling Sunday, I really couldn't believe it was a cake! You did a great job and thanks for the new info! all the best and hope to see you again soon! Fabulous cake! The little smiley face made me laugh. I'm visiting with sumo, hope you visit me too! Thanks for this recipe. I have been making cakes and candy forever and never tried this. Now that I have Grand kids, perfect time to make some cool shaped cakes. I love learning new things. Look out kitchen, here I come. Funny reminds me when my Mom and I took cake decorating classes, we had to make a cake for each class and having 2 cakes each week quickly became, who can we give this one to? Wish she were still with us, she would love this new (for me to try) technique. I use to have my own business selling homemade cakes, candies, etc.. This would have great back then when I need to make a small ball for a knitting ball for a cake topper.